BMW puts iPod displays in front of drivers with new iPod Out interface | What Hi-Fi? 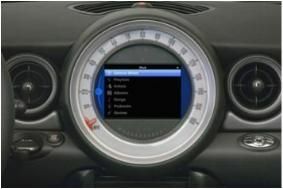 Using this, drivers of future BMW and Mini cars will be able to see their iPod display on the vehicles' information monitors, and operate the players using the car's infotainment controls. As well as simply playing tracks and skipping between them, drivers will be able to access iPod/iPhone features such as custom playlist Genius through the display and control system, via an integrated navigation menu. BMW says that the interface will be available as part of the ConnectedDrive system, and also in a new package called Mini Connected for the latest Mini models. The new system was jointly developed by BMW's R&D Centre in Munich and its Group Technology Office in Palo Alto, California, and if you'd like to see the chaps from BMW in Silicon Valley demonstrating what it can do, click here for the video.